Jacob Kleinjan started working for the Dutch East India Company (V.O.C.) as a soldier in 1786. He departed on October 24, 1786, from Rammekens in Zeeland, The Netherlands. The ship, named “Juffrouw Johanna” (which can be translated as “Miss Joan”), was a pink type sailing ship with a flat bottom, a narrow stern at the back and a large cargo capacity. The ship's captain was Simon Koter and its crew consisted of over 170 men. Since 1652 a Cape Colony had been established by the Dutch on the Cape Peninsula in South Africa. 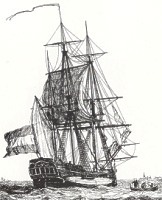 The “Juffrouw Johanna” arrived at its Cape Hope on February 22, 1787, staying there until March 19. On June 9, 1787, t he ship and its crew arrived at its destination, Batavia (nowadays known as Jakarta) on the island of Java in Indonesia. Within a year of his arrival Jacob Kleinjan died in Asia on May 7, 1788. According to the V.O.C. database Jacob Kleinjan originated from “Oostmont”, possibly Est Mont, Éperlecques, France. For more information about the Kleinjan Family take a look at my blogpost about The Kleinjan family and their American branch. Sources: VOC Opvarenden bij het Nationaal Archief, vocsite.nl, huygens.knaw.nl and Wikipedia. A privateer, that sounds fun! I've been in Eperleques twice. Interesting info!